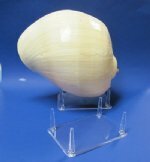 We carry a wide selection of wood seashell display stands, wholesale plastic seashell display stands and bulk acrylic display stands, We have seashell stands for large seashells and have small display stands to show off your coastal inspired décor. 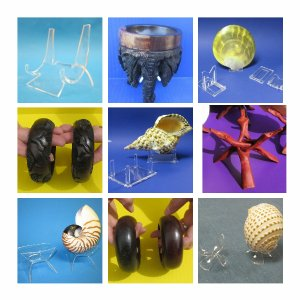 If you are doing any beach theme decorating that includes a nautical design, acrylic display stands are perfect for displaying sand dollars, starfish, large shells such as melons, murex, , volutes, giant spider conchs, horse conchs, pink conch shells and other treasures from the sea. They keep your furniture from being scratched and allow your seashells and other decorative items to be easily displayed. 10 inches Large Wood Display Stands, Wood Shell Stands Wholesale (Shells Shown are NOT Included) - Packed: 6 pcs @ $1.60 ea; Packed 3 dz @ $17.28 dozen.